History: Raised by his grandmother who was a retired tuner, she taught him the basics of air trek mechanics until she passed away, with no other family, he drifted away from home and ended up living on the streets. Being the headstrong indivual he is, he founded a gang with the other homeless and orphaned children on the streets making a living from thieving and pickpocketing. His fascination of air treks never died, instead it grew as he watched riders gliding through the slums of the streets , over the years him and his gang managed to "aquire" many sets of air treks from ambushing the low class riders in the alleys across the city. Franky always preferred modifying and repairing the treks himself rather than riding them but would don a pair every now and then to test them out, and it carried on this way for many a year, his family growing older and more skilled until one day they were approached by another storm rider team accepted their challenge. Franky's family were utterly humilated and forced to disband, he was also seriously injured having to have reconstructive surgery to his face. 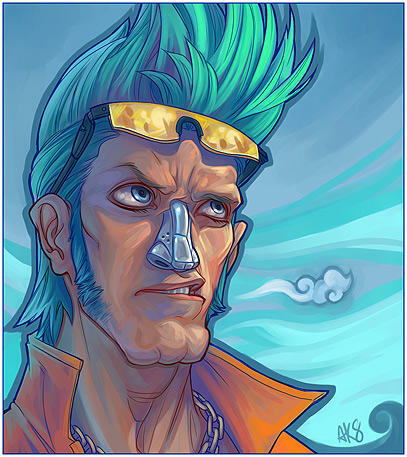 Soon after his recovery Franky sought out the Tool Toul To team his grandmother used to work for. Working for them for several years homing his skills his name became famous throughout the air trek world, however he always wished venegance against the gang that destroyed his family. Being the technical genius that he is, he has made robotic modifications to his own body. Personality: An enthusiastic and sometimes over the top man, but when push comes to shove he will knuckle down and becomes deadly serious. Harbours a deep grudge against the team that destroyed his family. It's nice to hear from you Hiro, it's about time you did something around here. You were the first person to join the site after its conception, and you still have yet to post anything that indicates your interest in |ATRP|. So indeed, continue with your posting, give me a reason to let you have your AT-Team, and make me proud. Whew! Back to the topic of the topic, and I have to congratulate you Beans, this is another sterling character from one of the masters of creation. Nice history, I'm liking the Fusion Road, veeeeery interested to see it in action. Also loving the pic, very fitting with your character's history, not sure if you based the character on the picture or found the picture to suit the character. Either way, fantastic.